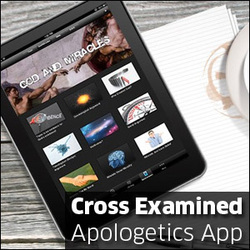 The Cross Examined App features content from author and apologist Dr. Frank Turek, president ofCrossExamined.org. It features a "Quick Answers" section that helps you respond to popular objections to Christianity, the Cross Examined blog, speaker schedule, and radio recordings- this app can help you grow and defend the faith.It has a quick answers section designed to equip people to do apologetics and evangelism in any situation by just looking at theiriPhone, iPad, or Android phone. 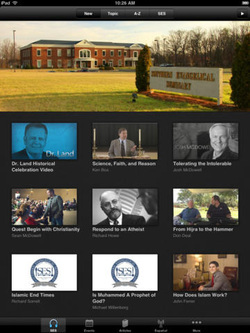 Doug Powell’s iWitness apps are unlike any other apologetics resource. They use the latest technology to present the historic Christian faith in a highly visual, interactive way. Each screen is packed full of things to explore, open, and engage, allowing readers to investigate the claims of Christianity for themselves rather than simply being told them. And they present scholarly information in a way that makes it easy to understand without technical language, simplifying it without being simplistic. For anyone who ever thought theology and apologetics were boring and dry – and for those who don’t!